Charles E. Fuller envisioned Fuller Theological Seminary as the “Caltech” of seminaries. His desire was to redefine, not just imitate, theological reflection and praxis in North America and beyond. 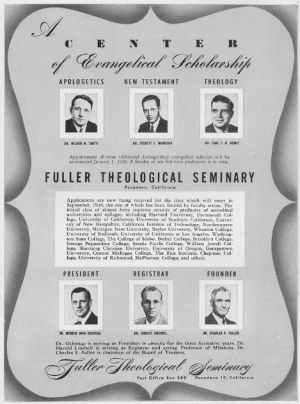 In the spirit of that vision, Fuller’s first generation of faculty members made enormous contributions to biblical and theological scholarship and laid the foundation for its 21st century scholars. “Early Scholarship at Fuller,” an exhibit highlighting the contributions of this first generation, will go on display Friday, July 27th, in the DAHL lobby. Featured scholars include Wilbur Moorehead Smith, Everett Falconer Harrison, Carl F.H. Henry, Edward John Carnell, Geoffrey H. Bromiley, and Rebecca Russell Price, among others. Some of their contributions include seminal translations and the production of key theological treaties, dictionaries, bibliographies, and Christian education curricula. Bromiley, in particular, made his mark by translating crucial works of European theology such as the writings of Karl Barth, Helmut Thielicke, and Jacques Ellul, as well as many others. The exhibit will be on display until Monday, October 15th. Also, please check out our libraryarchives.fuller.edu site for past archival exhibits and resources!